I have Megaman 3 on NES. I have the Wily Wars rom. I even have the old issues of Nintendo Power covering Megaman 3. But always there has been a space that remained incomplete. A space that, while small, SHOULD be filled by *the* Megaman three team! And so it came to be the I, GAUNTLET, gained the last bit of merchandise I am aware of to make this Megaman 3 page truly complete. 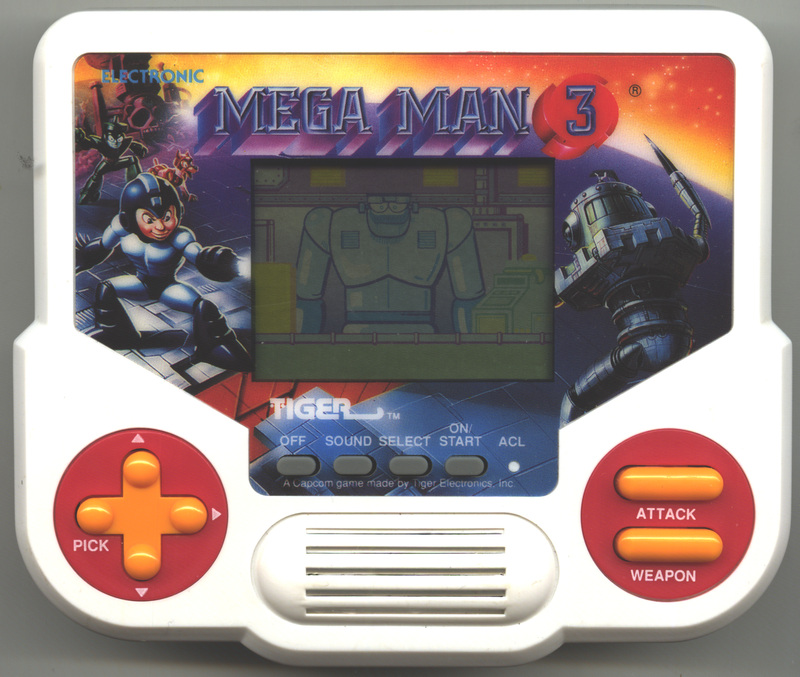 Megaman 3 for the Tiger Handheld systems. For $9.99. Of course the actual price would be somewhat higher after conversion to Canadian dollars and shipping charges ($29.70 *groan* I hate ebay sometimes) but at least I have the game. Seeing as Joey's Megaman Corner already has a substantial section on the game covering in-depth game hints and nice "sprite" scans ...... I won't go into any of that, Instead I shall offer my own take on the game. Which means this is mostly an opinion peice and not really contributing much beyond my own humour and (warped) take on things. It takes a special kind of mind to like a Tiger game. You basically have to like patterns. Memorizing and following lots of patterns. Each enemy has a certain pattern to them and you'd be well advised not to even bother killing minor enemies. The only way you can possibly win is to not get hit and not miss. This is not as impossible as it sounds. You just need allot of patience. I think Dr. Wily might be off enough to like a Tiger game. I admit sometimes they can be fun. You kinda have to .... zone out a little. It's not like an actual video game. There, if people watch, you can get some cheers or ..... I dunno, a pat on the back if you beat a hard boss or something. Tiger games aren't quite like that. You pretty much have to pretend you're playing a video game. In this way it requires a sort of make-believe that small children might find amusing, were it not for the bleeps and bloops. But I'm being a little hard. I've played a few LCD games in my day. About four. And outta all of them Tiger's Megaman 3 does really shine. Yes, you heard me. It's really decent for a Tiger game. I actually found myself enjoying this game for quite a while after achieving a zen-like state of non-thought where I memorized patterns and responded to threats with an animal like instinct. Hmmmmmm .... animal-like ...... you suppose that's why they called it Tiger electronics? Dr Wily is back with an arsenal of robots so strong, so devastating, that the entire universe is in peril. These Wily creations plus the other enemies he has unleashed have such power that only Mega Man can defeat them. When you defeat all these enemies, it sets up a classic confrontation of epic proportions -- Dr. Wily in the guise of a giant robot against Mega Man! It is a fever-pitched battle where only one can survive! When you turn the game on you're greeted with this lovely tune of music. After turning off the sound you're ready to play! At first I found the game to be wholly confusing and nonsensical. Unlike most gamers I don't like reading instruction manuals for games. Certainly not games made in 1988! So it took me quite a while to learn that energy capsuls aren't picked up simply by moving. Or that arm cannon shots can run out. Little things like that. But in the end I had some fun with this most obscure of obscure Megaman games. Y'know, you gotta admire Tiger for using that USA edition Capcom art. Mmmmmm .... midgilicious! As in midget. To note: this has gotta be the most used piece of USA box art EVER. Not only was it in MM3 (NES), but obviously in MM3 Tiger, the MM1 Gameboy game, AND in Megaman 3 PC. Hm, one thing I noticed that I didn't notice before was the neat background . I mean, not only does it show alot of Gamma, but he's also in Dr. Light's Lab! Alright, so it doesn't match up at all with Capcom's official art for Gamma. *pffft* what-EVER. And, apparently, Light moved his furniture around a bit too. Instead of thinking practically and saying "they spliced together one of the coolest, non-partial game scenes with the last boss" I look for a deeper meaning. Clearly, Dr. Light has once again forgiven Dr. Wily and clearly it is up to MM to rescue him! Why clearly? Well, think about it. Gamma is still in Light's Lab. And thanks to my high-rez scan you can see he has some gunk stuck between his teeth (eat with your mouth CLOSED, Gamma!). Megaman's weapons don't refill. So maybe Wily has taken over Light's Lab! Maybe Wily is holding Light hostage while setting up all six robot masters out to guard the base! Maybe Megaman Tiger is the most action packed and thrilling story that Megaman has ever been in!! Or maybe not. What do I know? 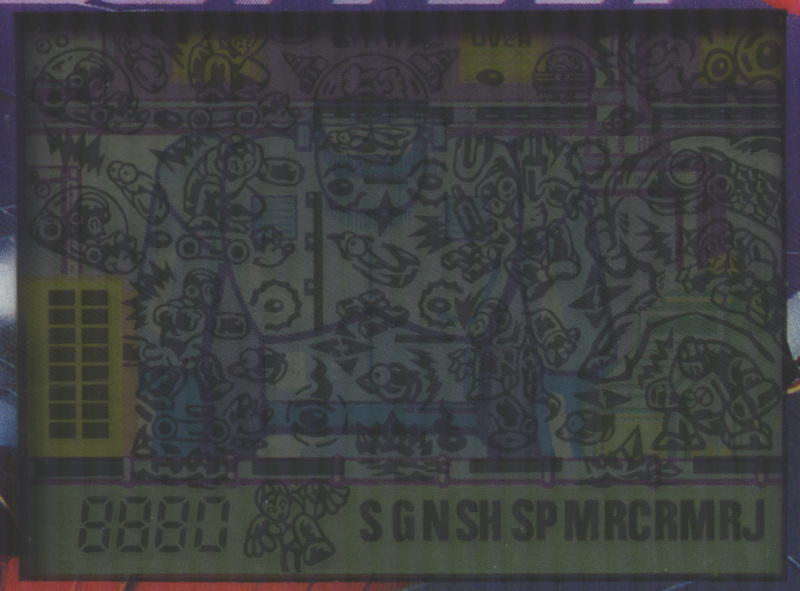 Here's the "spritesheet" of Megaman 3. due to the depth of the screen all the colors are muted. 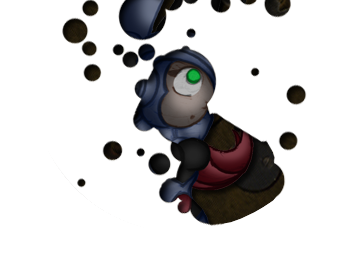 While I could fix this it sort of obscures the "sprites". And that's a bad thing in this case. Also note that the game is MUCh cleaner in real life. I dunno why, but that scanner seems to make it dirtier. Note that this is the highest rez I can get on the game! Woo-hoo! High-rez crappy MM art! Only on the Mechanical Maniacs, people. So, that's Megaman 3 Tiger in a nutshell. 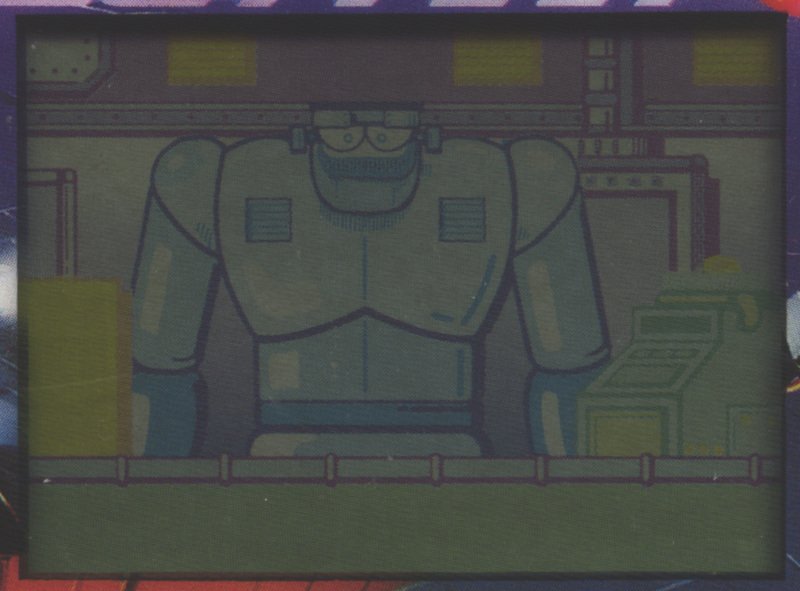 Ultimately I'm tickled pink just to have something rare and nifty relating to Megaman 3.